This building was built the year 1920 being one of the first movies of Lleida. 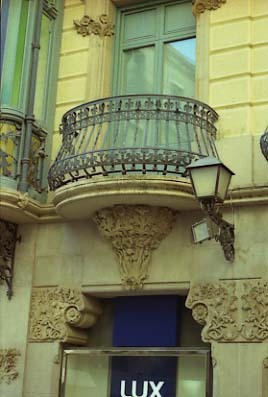 The façade shows a mixture of styles, among Art Nouveau and noucentist (the style following the Art Nouveau in Catalonia). At present the building has been restored and presents a very spectacular façade that offers a coloristic aspect to the zone of Blondel Avenue in which it is found. 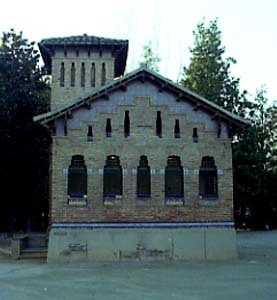 Small Art Nouveau building built by the architect Francesc de Paula Morera i Gatell with brick, adorned abroad with glazed ceramics. 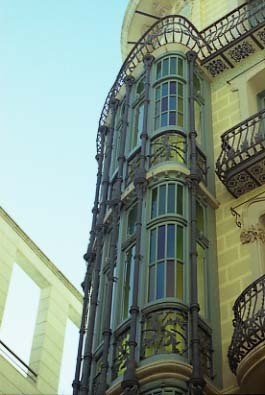 The doors and windows show the typical disposition in steeps so frequent in the Catalan Art Nouveau. The interior, unfortunately in bad condition due to its present utilization, still conserves some interesting engraved beams. Projected by Joan Bergós, of who is the most significant building, in the year 1921. It was built in a period of transition in which the Art Nouveau schemes were only circumstantialy used. 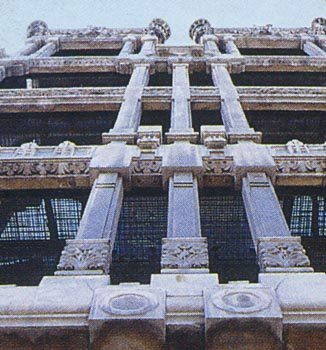 Unique element of the Art Nouveau in Lleida by their formal characteristics in the façade with the view points of the corner and the singular processing of the openings, all it reinforced with the chromatic quality of plaster. Some parts of the building are to emphasize as the wavy lintels and plaster of the facade, with geometric forms. During the rehabilitation works it appeared in the basement some remainders of the old Gate of Sant Antoni (XVII century), wich is a gate of the city built together with the new wall. Known popularly as La Vinícola because during many years its low plant was a wine cellar with this name. 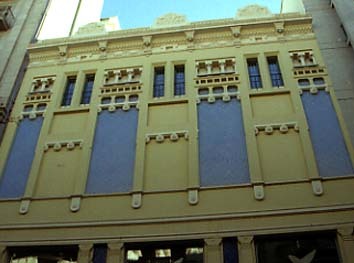 Art Nouveau style building projected by the architect Francesc de Paula Morera i Gatell. 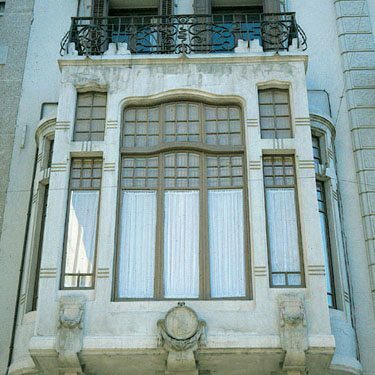 It was built between 1906 and 1910 and carries this name because it seems that it was the house of a prestigious architect of Lleida, Joan Bergós. This building show an interesting architectural representation of balconies and typical moldings of the Art Nouveau. One of its values is the beauty of the work of forges and the use of Art Nouveau ornaments of geometric and floral shapes. Historically, it was built in a cultural period of great strength in which the middle-class buildings was treated with great care and a certain degree of illustration. In a balcony of the adjoin house, the historic Bookstore Fregola, there is a figure of the Virgin of the Pillar and the child Jesus. It is a reproduction of the year 1740, of baroque style, of an old sculpture in wood of the XII century, that is illuminated each 12 October to venerate the Virgin. Building erected according to project of the architect Francesc Lamolla i Morante, the first plans of which are in the City Hall dated in 1898. It was built in full Art Nouveau period even when its style cannot be exactly qualified of Art Nouveau. It emphasizes for the artistic processing of the facade, in which the balconies, the floral motives of stone of the ground floor or the gallery are very interesting. 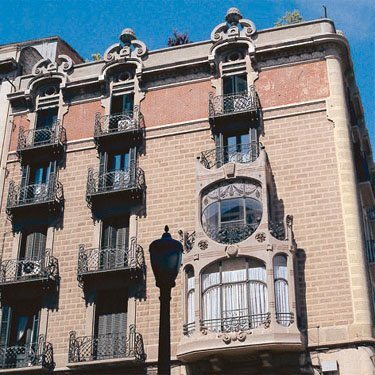 It was the house of the banker of Lleida Magí Llorens but it is also known as La Pedrera lleidatana by the great quantity and quality of its artistic elements. Even when in the high part of the house the date of 1905 can be seen, in reality it was not built until 1907. In the year 1998 the building was bought for a business of construction to reconvert it in a building of dwellings, while the disappearance of the Bulevard Victory enabled to reconvert part of the ground floor in two modern stores. The works permitted to recover the facade to ends of the year 1999 while in autumn from the 2000 the building, with 35 flats, already began to to be inhabited. The paintings of the interior of the access gate are very interesting. 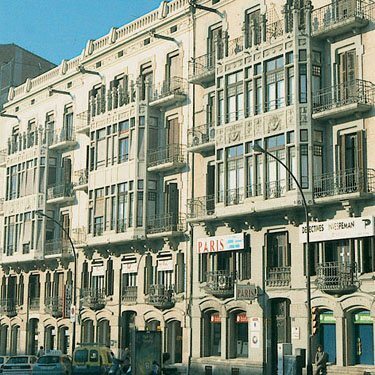 The long history of the house in a so central place is the reason wy it were the headquarters of companies as diverse as the Press of Republican Youth of Lleida, the Red Cross or the Youth Spanish Organization (OJE). Also the poet Magí Morera i Galicia. Its ground floor had in 1908 one of the first movie theaters of the city, the Porfoliograph, best-known as the Porfolio. The history of this building has been the object of a study of the historian of Tàrrega, Camila Minguell Cardenyes. 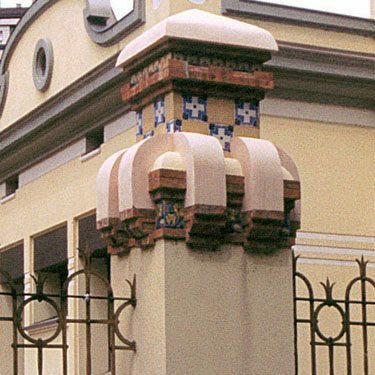 Art Nouveau style building projected by the architect Francesc de Paula Morera i Gatell. Built in the year 1910. 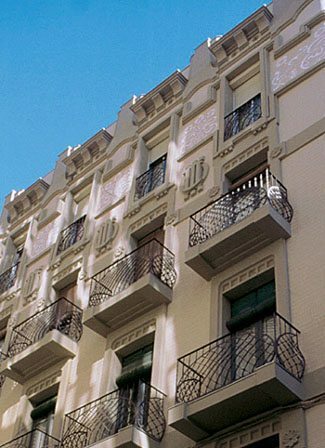 Plastered façade, balconies in projecting and gallery on first and second flats with polychrome glasses of the same style. It is interesting to emphasize the great chromatic efects, the stone plastered, the joinery and forge with Art Nouveau ondulations. Its internal structure show pillars of foundry, stair of wood and tiles of Valencia. 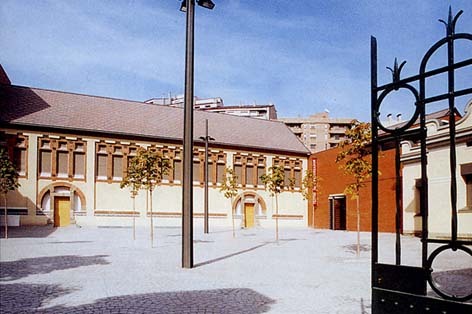 The building revalues the square of Sant Francesc contrasting with the other buildings by its chromatic value. The ground floor have suffered changes by adaptations to new uses. Art Nouveau building of the year 1920 projected by the architect Francesc de P. Morera i Gatell. The building that had two plants of height, was mended respectful in the year 1950 according to project of Marià Gomà. This added was made very carefully so that the facade have an unit aspect. The quality of the details of ornamentation of the interior and the courtyard of the ground floor is good. The original door of entrance – altered since in a side a known café was opened – gave access to the carriages to a courtyard extended to almost the end of the plant. 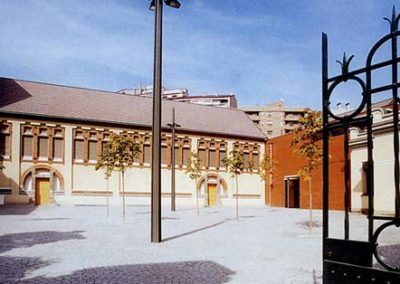 The Art Nouveau style building, projected by the architect Francesc de Paula Morera i Gatell, is an assembly of three buildings aligned and dated in the year 1914. To emphasize the two plants with gallery and hall with graffited marble and joinery, stairs and flooring also of marble, banisters and floral graffitos. It can be visited in case of theatrical representations. Building projected and built between the years 1912 and 1915 by the architect Francesc de Paula Morera i Gatell, by assignment of Eduard Aunós to be used as an hotel. Very luxurious façade plentiful of decoration. The columns raise itself to two small temples crowing the building. Recently the building was substantially rebuild, despite that the original facade has been respected. Art Nouveau style building, projected by Francesc de Paula Morera i Gatell and built in 1918. The building is composed of two arranged ships perpendicularmente, of simple structure and linked by a cylindrical element with a brick dome. The main gate two monumental doors. Just as its name indicates, the building was used as slaughterhouse since its construction the year 1918 until the year 1984 when after to its restoration and restructuring it became an cultural equipment. 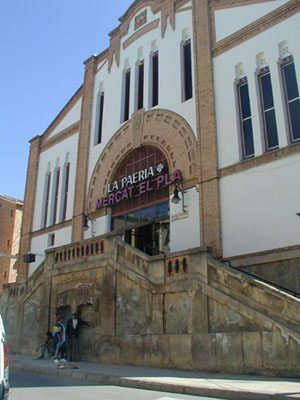 At present the building is the municipal theater of Lleida. Art Nouveau industrial building with a rectangular shape and elegant and compact structure. 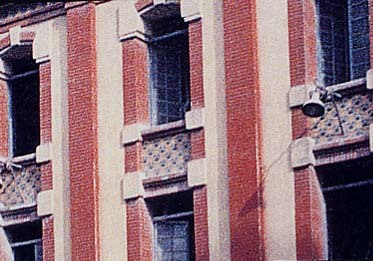 The façade shows some of the typical decorative elements of the Art Nouveau, as the construction combined in stone and brick harmonically interspersed. Ceramics are also present especially as vertical element of windows separation. Built between the years 1920 and 1922 according to project of Joaquim Porqueres and under the direction of Francesc de Paula Morera i Gatell. Typical Art Nouveau building with a simple but elegant façade culminated by a pediment of original design that combines the brick, especially in the elements of support, with the plaster of the walls. 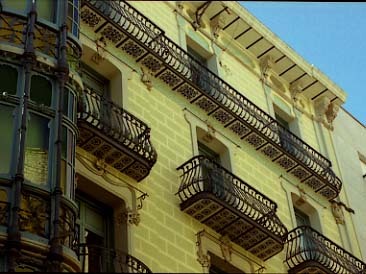 The steeped windows are also a very habitual component of the Catalan Art Nouveau buildings. The building was since its construction a municipal market as it is today. It occupies the lands of the old University of Lleida and the barracs of cavalries. Location: Les Afores, s/n 25111 Raimat (Segrià). Visits: Saturdays and Sundays, at 10.30, 11.30 and 12.30 h.
Art Nouveau style cellar projected by the architect Joan Rubió i Bellver. Built between 1918 and 1924. The subsequent enlargements have been projected for Domingo Triay. 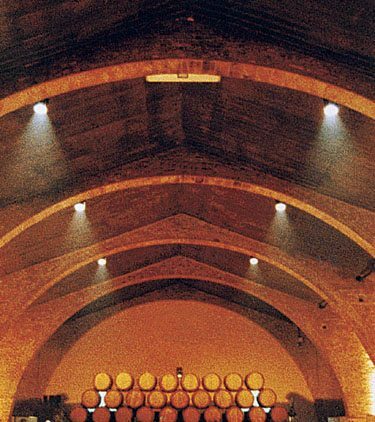 Named the Cathedral of Wine, – denomination also used for the rural buildings of the architect Cèsar Martinell – it where absolutely innovative by its structure of extensive arcades and by the utilization of new materials, as the concrete. Series of warehouses against the lateral of the great main bay. The solution can be emphasized to isolate the cover of the interior by means of stagnant water, at present substituted by solid isolating materials. All the spaces are illuminated by small beams of light entering through small glazed windows. The new structure, is perfectly connected with the old zone of the wine cellar. This new space is on the place of a previous hill and is adapted perfectly with the landscape. This space normaly called pyramid dates of the yhear 1988. Into the property, another interesting building is found, the Raimat Castle located on a hill over the village. This castle is much more old thant the rest of buildings, the first references dated on the XI century, having suffered different enlargements, for which the historians situate its present basic structure in 1627. This castle is more residential than defensive, and the interior was restructured in 1914. The lines of the fortificación are very austere. At present it is used as a residence by the guests of the Raventós family. Other architectural new but very interesting element, is the hill that was emptied to install in its interior the new wine cellars, planting later a hectare of cabernet sauvignon over it. Inside the modern building we can observe a pyramid of 3.000 kilograms that was transferred with ice and was left to melt to set the position of this geometric figure. The wines of this exploitation are of a big quality, for these reason it are served in the supper of gala of the Nobel Prizes in Sweden.